G.Skill on Friday announced its new top-of-the-range DDR4 memory kit for dual-channel PCs running Intel’s Kaby Lake processors. The new Trident Z kit for operates at 4333 MT/s (DDR4-4333), though it requires a bit of extra voltage to get there. In addition, the company said that it was working on even faster DDR4 DIMMs. 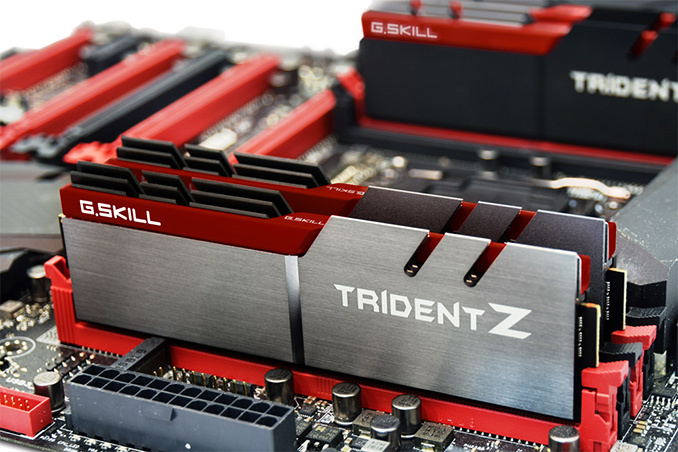 The new G.Skill Trident Z memory modules are based on Samsung’s 8 Gb DRAM ICs (B-die, 20 nm), which also power other high-end DIMMs from the company. The 16 GB kit (F4-4333C19) consists of two 8 GB modules rated for DDR4-4333 operation with CL19 19-19-39 timings at 1.4 V, which is above the standard high-performance voltage setting for DDR4 (1.35 V) and is considerably higher than JEDEC-specification of 1.2 V. Just like the rest members of the Trident Z family, the new DDR4-4333 kit comes with aluminum heat spreaders (so, no RGB LEDs just yet) as well as SPDs with XMP 2.0 settings. G.Skill is the Trident Z DDR4-4333 kit for use with Intel’s Z270 platforms and Kaby Lake processors. So far, G.Skill has only validated its F4-4333C19-8GTZ modules on the ASUS ROG Maximus IX Apex motherboard and the Intel Core i5-7600K processor, but expect the list of compatible mainboards to expand over time. 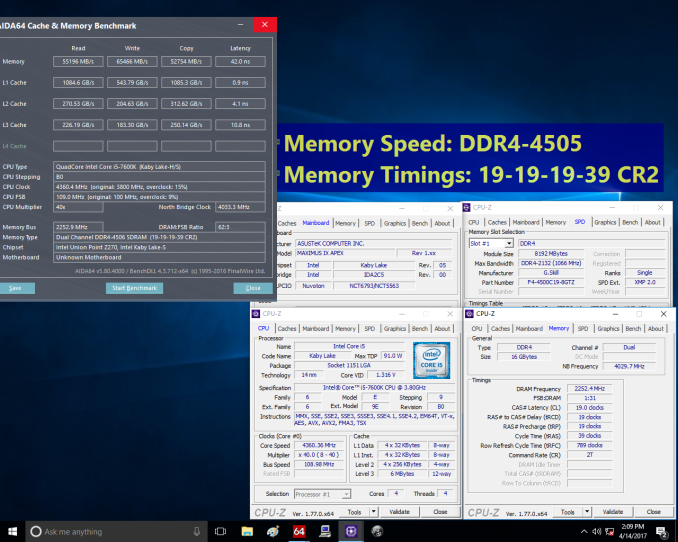 In addition to announcing the new DDR4-4333 kit, G.Skill also teased DDR4-4400 (F4-4400C19-8GTZ) and even DDR4-4500 (F4-4500C19-8GTZ) 8 GB memory modules working in dual-channel mode. The company is still working on such DIMMs and finalizing their specifications (timings, voltages, etc. ), so do not expect them on the shelves for a bit. It should be noted however that this week's announcement is just that: an announcement. The actual product release will come later. G.Skill has not yet announced when that will be; presumably the company is still binning chips and building up a launch supply. We'd also expect the retail price of the kit to be announced at that time. At present, a dual-channel 16 GB DDR4-4266 kit costs around $250, so it's reasonable to assume the new DDR4-4333 kit will be priced above that.